Brian Cullen is a former professor of classic literature who lives near Lunenberg, Massachusetts, and in Ireland. He lives in a house filled with books and music in a world of his own creation. Seekers — (2008-2009) Publisher: In the time when gods and men walked the earth along with demons, the Chalice of Fire, the symbol of peace for Ulster, is stolen from the Red Branch by Bricriu Poisontongue. A small band of Seekers sets out to recover and return the Chalice to the Red Branch to restore peace to the Ulster kingdom. The Seekers are a group of two elves, Bern and Lorges; Cumac, the son of Cucullen, the greatest Red Branch warrior; Fedelm of the Sidhe; Tarin, the Swordwanderer; and the wizard-druid, Seanchan. Together they must make their way through the world brought as Maliman, the evil wizard, uses his powers to stop them as he seeks the Chalice himself to bend its magic to his will. The Seekers battle their way through the creatures of darkness that threaten to conquer the world. But they are determined to bring light back from darkness and restore the land that has fallen into ruin and decay with the theft of the Chalice. An epic tale that brings to mind the works of J.R.R. Tolkien, David Gemmell, and R.A. Salvatore, Seekers of the Chalice is the first book of a trilogy that explores the ongoing battle between good and evil in a land that is teetering on darkness. 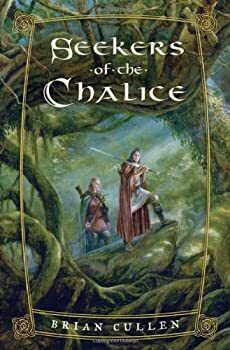 Seekers of the Chalice is the story of a small group of heroes who set out to recover the Chalice of Fire, a symbol of peace for Ulster, after it is stolen from the Red Branch by a traitor. The premise behind the book, which is an attempt to do a high fantasy retelling of the traditional Celtic myth Táin Bó Cúailnge, is great. However, the execution falters. The characters are flat, the dialogue stilted, and the plot is an endless series of near identical battles against every imaginable dark creature. Pixies and goblins and werewolves, oh my!